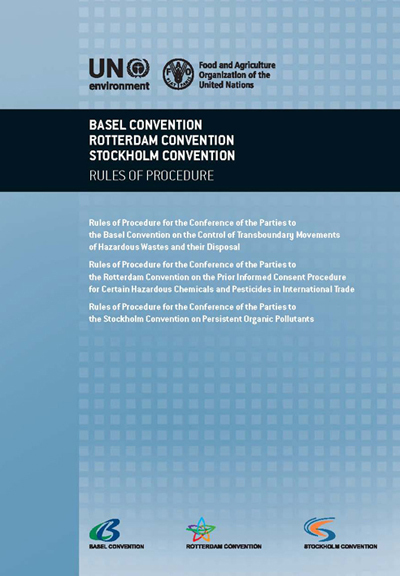 The rules of procedure for meetings of the Conference of the Parties to the Basel Convention on the Control of Transboundary Movements of Hazardous Wastes and their Disposal, were adopted by the first meeting of the Conference of the Parties (decision I/1) and amended by the seventh, the tenth, and the eleventh meetings of the Conference of the Parties (decisions VII/37, BC-10/1, BC-11/24). The rules of procedure apply to any meeting of the Conference of the Parties to the Convention convened in accordance with article 15 of the Convention. Unless decided otherwise by the Conference of the Parties and with exceptions as set out in rule 26, these rules apply to the proceedings of any subsidiary bodies, subject to any modifications decided by the Conference of the Parties. 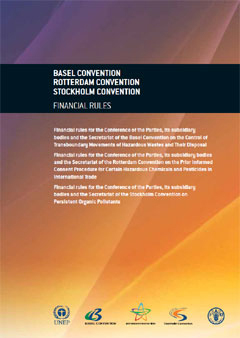 The financial rules for the Conference of the Parties, its subsidiary bodies and the Secretariat of the Basel Convention on the Control of Transboundary Movements of Hazardous Wastes and their Disposal were adopted by the tenth meeting of the Conference of the Parties (decision BC-10/28).